Discussion in 'In the News' started by Right Lane Cruiser, Sep 8, 2012. Today is a fantastic day; not only is it the Friday of a highly productive work week, I received my very own LEAF 4 months ago to the day! A dream conceived 23 years ago came true that day and after 1/3 of a year and 3000 miles, it's time to take stock of my long term impressions. Most people want to know right away how much range the vehicle offers when I drive it on my normal routes. Even though the majority of drivers find the range estimate (analogous to the DTE gauge in a conventional vehicle) to be specious, my experience has been that with consistent driving it actually does a good job of predicting how far the car can travel at the current level of battery charge. I had expected to do more driving today so I charged to 100% this morning before my morning commute -- I still have plenty left after a 29.8 mile round trip and it is obvious the car can easily exceed 100mi with me behind the wheel. In fact, I can exceed 100 miles on just an 80% -- no range anxiety for me! But that's just low speed driving, right? How far will it go on the highway at a "normal" speed with AC on?? After driving over 83mi on the highway at around 60 mph, with the AC set to 78 F and low fan in 96F ambient temps, with the whole family in the car I still had plenty left to make it over 100 mi on the full charge the battery had when I started. Yes, I'm a Hypermiler, but that was simple Drive With Load in the right lane with smart braking as necessary to deal with moderate traffic. Dropping the speed by 10 mph would ramp the achievable distance up quite a bit, as would turning off the AC... but part of the deal I made with my wife for purchase of this vehicle was a bit faster driving with the creature comforts when the family is in the car. Not a problem in my book because the MPGe was still over 161 on that long drive -- something I couldn't match in the Insight without dropping the speed to under 30mph, no AC, no passengers, and driving in perfect conditions! In fact, the car is returning highway distances in these conditions matching what I thought I'd get with lower speed and no AC on. So how about comfort? At 6' 5" I find the upright and high seating position quite comfortable with plenty of leg room for this 36" inseam driver. The LEAF passes my standard passenger volume test with flying colors: I push the driver's seat as far back as I can, see if I can swing my right knee under the steering wheel while depressing the brake pedal, then attempt to sit behind the driver's seat without moving it from the position I need for driving. While leg room is a little tight for me behind the driver's seat in this position, I could ride back there for multiple hours without much trouble. What about the rest of the back seat? I'll let a picture convey how my children feel about it. My daughter is quite intrigued that "Daddy's car doesn't need gas! Only Mommy's car does!" Now we come to what things surprised me pleasantly. First off is the sunglasses holder. It is large enough to contain even the largest pair of sunglasses my wife can find (and trust me, they are LARGE). The pair I usually wear aren't all that big but the lenses are tall enough that they won't fit in the Fusion Hybrid's holder -- but this one swallows them with room to spare. I also like the large rocker switch which is well labeled so its use is obvious, and the simple "press this lens" for map lights. I'm really not sure why Nissan felt it was necessary to add another headlight indicator here, but there is a small orange light which turns on whenever the headlights are activated. Second, this car really is QUIET. Anyone who has ridden with me for any reasonable length of time knows that rattles and squeaks drive me nuts! I expected the car to be solidly built and carefully audited for such noises but I did not expect it to be so successful in a wide range of temperatures. I haven't had it down to winter temperatures yet but I've no complaints about sounds between 46F and 98F. In fact, the only noisemaker in the car is the front passenger seat belt. When retracted the latch rattles against the pillar but I discovered that simply turning it so that it was propped up on the seat cushion is sufficient tension to eliminate the rattle. Any other noise in the car is either cargo or the occasional car seat latch click. Very nice indeed!! The auto-dimming rear view mirror is responsive and the integrated Home-link buttons are a welcome addition -- neither is a feature I've ever had in a vehicle before. Installing the car seats was easier than in any other vehicle I've attempted the job -- partly because the lower Latch points hang from the seatback rather than being buried nearly behind the bottom seat cushions. The top Latch points are easily accessible from the hatch making adjustments a snap. The LED headlights are so bright and even it is like driving with well controlled flood lamps attached to the hood compared to what I'm used to! High beams are still necessary for longer distance viewing but that is mostly a matter of directional alignment, not lumens. Watching the usage gauge reveals that they only consume about 0.1 kW when turned on -- very impressive! Annoyances are few, but no car is perfect. The glove box is quite small and oddly shaped. The shift to N is delayed by 2s so coasting is not as easy as it could be. The pedestrian alert noise can't be silenced in this model year because the button was removed (along with the associated electronics and programming, apparently -- it is possible to hack into the system to add the functionality back but it involves cutting wires and adding components). On the flip side, though, I was amazed to find something else in the button panel I'd never seen in a car before. The LEAF features a rotary headlight leveling control so that you can point the headlights further down than normal to deal with hilly terrain better -- either to illuminate drop offs better or to avoid blinding the poor fellow across the intersection from you. That's just plain cool if you ask me! I tried it out while aimed at the side of a hill and there is a brief delay after changing the knob position, but then a servo changes the height. Magic! That weight means you have to be very careful about momentum conservation, and as with hypermiling any vehicle this is the most import aspect of getting max efficiency. Don't stop unless you can't avoid it (legally)!! I also keep my accelerations under 20 kW -- usually only half of that or less. A good target is keeping the instantaneous efficiency reading at somewhere between 1/10 and 1/5 of the current speed while accelerating -- this is a good goal up to around 40mph. It turns out that this car actually can be driven too slowly to be maximally efficient -- that isn't something I expected to discover in an electric vehicle. Part of this is drive-line drag (the reduction gear is always "engaged" and at speeds under what the dash will report you can feel a rhythmic jerking due to the permanent magnets in the motor -- the car can't coast like the Insight) and part of it is all that mass causing small deviations from perfectly flat to really hurt. For fairly level ground you'll want to maintain at least 18mph to be able to max out the instantaneous gauge (at 8 miles per kWh). Keep the usage showing nothing but that black sliver pointed right at zero and you'll be close. You can actually use the Eco Tree circular gauge to judge more precisely what power is being expended if you are in Drive mode rather than ECO mode -- get all the segments lit while avoiding any regen indications on the Electric Motor usage graph and you'll be as close as you can get to a zero power glide without dropping the car into Neutral. Don't bother with ECO mode for regular driving -- I've consistently beat the efficiency of that mode with Drive mode but I do use it the way a proficient Prius Hypermiler uses the B setting of that vehicle. Shift into that mode when you want to increase regenerative braking without applying pressure to the brake pedal. Lastly, there are a few quirks in the car. One is that the Nav screen always reports 0.2 miles per kWh higher than the dash. Another is that the instantaneous readout will "freeze" at maxed out for a while after regen -- how long depends upon how much regen was done. You can actually get the car to move without the pedestrian alerts if you get it rolling from a stop or near stop in N. This works in both forward and reverse directions. I'm told that you can skip out on the 2s delay when shifting to N if you attempt to shift into Reverse instead while driving but I've not tried it personally. Even if it does work I have no idea if that is something that is monitored by built in logging and then examined during the annual inspection of the vehicle. I'd rather not stand out that way so I've cultivated the rock steady foot control necessary to create a zero energy glide condition with pedal position only. One last tip -- don't leave the charging cable coiled!! I was able to improve charging efficiency by 2% when I eliminated the inductive losses caused by the coiling. In summary, this car has met and exceeded every one of my expectations -- the better than 2 decade dream has been realized with even better functionality and performance than I ever believed possible and I'm well pleased!! This is a wonderful car to drive, and it is excellent to hypermile. Job well done, Nissan! Thanks for the nice report Sean. Glad to hear that you're pleased with your purchase. I had a Nissan Quest as a family vehicle from 1999 until 2009 when I got in on the cash for clunkers deal and replaced it with an Elantra and even my wife (die hard American car woman) loved to drive it. 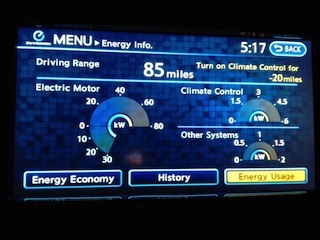 The Cube I rented when my car was in an accident was fun to drive and did better than I anticipated with fuel economy. I am interested in responses from others who have experience with driving hybrids. Hi, Herm -- it is a bit over 6mpk for all mixed driving right now. I really need to get the mileage logs software updated so I can tally it up properly here on the site but I figure I'm doing pretty well considering the 99MPGe combined rating from the EPA works out to right around 2.9mpk. Have one question: What is the actual electricity from the utility cost per mile? The reason I ask is that a number of years ago I had a converted S10 with lead acid batteries. Found that you had to put in a lot more electrons than the batteries themselves provided to the motor. I’m sure that lithium batteries are much more efficient in your case. I installed a KWH meter in the garage to keep track of the electrical usage of the truck. For me the cost per mile was ~8¢ (or .75KWH). Then there was the 3 yr replacement cost of the LA batteries, another 10¢. So at the time the experiment did not turn out so great even tho on a minimal investment. Glad the manufacturers are providing production EV’s now. With the provided "opportunity" EVSE hooked up to a 120V outlet I've found the efficiency to be 73.4% from wall to road. In other words, the ratio of energy used during my driving to energy pulled from the wall (measured with a Kill-A-Watt meter) to replenish the used charge is 73.4% with the charging cable hung in a single large and loose loop over the shelving in front of the car. Right you are, KSStatHead... but there is no engine braking in this car. 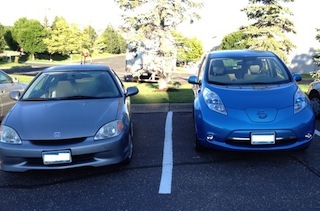 I suppose it would have been more correct to state that using ECO mode in the LEAF and B mode in the Prius accomplish the same goal of more braking without using the physical braking surfaces. so about max 129 miles of range for you, or 106 miles from a 100% charge until all the bars disappear... or if you only charge to 80% then 80 miles until all the bars disappear. Your safety reserve is about 23 miles. Not bad at all..
That's roughly correct. From what has been reported you can get 18kWh from the battery starting at 80% charge, and 21kWh starting at 100% (max). Using a typical commute efficiency (for me) of 7mpk that equates to a range estimate of 147 miles on a 100% charge -- tantalizingly close to the 150 miles needed to reach the lake house from home. Too bad there aren't 35mph limited roads all the way!! Hitting an average of 7.5mpk at low speed with few stops wouldn't be a problem and leaves me enough reserve to make it without hitting the paperweight stage. If we could somehow get Little Falls to install a Quick Charger, that would be perfect. 70mi there from my house, charge for an hour to get back to full (over a lunch break? ), then another 80mi to the lake; perfectly achievable in summer on the highway. This was an excellent long time review. Thanks for sharing a lot of knowledge. This is a very interesting car. Nice review Sean - thanks. I'd love to have a drive in one. I've only seen 1 Leaf in the UK even though it's the top EV seller here - Nissan has sold 343 Nissan LEAF electric cars in the UK in the first six months of 2012. It's pretty pricey over here, it currently sells for just under $41,953, once the government grant of $8,000 is deducted. EV's are still a tiny part of the market in Britain. Last year just 1,000 electric cars were sold, even though the government offered its considerable incentive to buyers. Unfortunately, it will take time and more advances (or gas price hikes) for EV sales to increase substantially on both sides of the pond. You guys will see the Renault Zoe very soon, production is speeding up now.. a far better (AFAIK) electric car. I would like to see it offered in the US also, battery lease and all, cant be that hard to get US emissions certification for it. Thanks for such a great review from a 6'+er. It is nice to know that they built this to handle us taller people. When I make my transition from the military, I might have to look into one of these for my next shorter commute. I've got ~8 months with my LEAF. I agree with Sean's review and findings. I find it has about the same interior room as my 2007 prius. I did find a rear facing carseat is tighter in the LEAF - at least for getting the kid in or out (but not really an issue as the prius remains the primary kid-carrier). I use the car for my commuting plus it gets some errand duty, but not tons of miles. I'm, at best, a moderate hypermiler. Since delivery in late Jan, I've got ~3400 miles with an average (carwings reported) economy of 4.3 miles/kWh and a 800kWh consumption. If you figure a charge efficiency of 85% and my electric rate of 15.1c/kwH I've spent just 4.2c/mile. so, in practice, probably about half the cost of driving my prius. The worst case range of a Leaf in artic weather is about 50 miles (per Nissan).. the new 2013 model will have a heat-pump heating system so it should be a lot more economical with the electricity.. it does come with heated seats and steering wheel. I've got Radian RXT car seats in mine and just installed the second one rear facing two days ago (the boy is too big for his bucket seat now!!) without any issues -- there's even clearance between that seat and the back of my driver's seat! I'm not convinced the heat pump will help in extreme temperatures, though it will definitely help in more moderate temps of say, 20F and up? 20F .. thats below freezing!.. gulp! I think it got that cold here... once.